Editors: Cecilia Heyes Bennett Galef, Jr. The increasing realization among behaviorists and psychologists is that many animals learn by observation as members of social systems. Such settings contribute to the formation of culture. This book combines the knowledge of two groups of scientists with different backgrounds to establish a working consensus for future research. The book is divided into two major sections, with contributions by a well-known, international, and interdisciplinary team which integrates these growing areas of inquiry. J. Terkel, Cultural Transmission of Feeding Behavior in the Black Rat (Rattus rattus). B.G. Galef, Jr., Social Enhancement of Food Preferences in Norway Rats: A Brief Review. D.M. Fragaszy and E. Visalberghi, Social Learning in Monkeys: Primate 'Primacy' Reconsidered. L.A. Dugatkin, Copying and Mate Choice. L. Lefebvre and L.-A. Giraldeau, Is Social Learning and Adaptive Specialization? K.N. Laland, P.J. Richeron, and R. Boyd, Developing a Theory of Animal Social Learning. M.E. West, Social Learning: Synergy and Songbirds. R.R. Provine, Contagious Yawning and Laughing: Significance for Sensory Feature Detection, Motor Pattern Generation, Imitation and the Evolution of Social Behavior. C.M. Heyes, Introduction: Identifying and Defining Imitation. T.R. 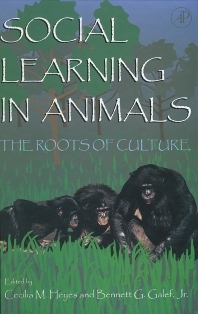 Zentall, An Analysis of Imitative Learning in Animals. B.R. Moore, The Evolution of Imitative Learning. M.A. Huffman, Acquisition of Innovative Cultural Behaviors in Nonhuman Primates: A Case Study of Stone Handling, a Socially Transmitted Behavior in Japanese Macaques. A. Whiten and D. Custance, Studies of Imitation in Chimpanzees and Children. M. Tomasello, Do Apes Ape? A. Meltzoff, The Human Infant as Imitative Generalist: A 20-Year Progressive Report. C.M. Heyes, Genuine Imitation? Chapter References. Author Index. Subject Index. Cecilia Heyes completed her doctoral research on social learning in animals in the Department of Psychology at University College London (UCL), under the supervision of Professor Henry Plotkin. As a Harkness Fellow of the Commonwealth Fund of New York, she spent two years in the United States, studying evolutionary epistemology and philosophy of science at the University of Chicago, Lehigh University, and Tufts University. On her return to England, she was a Research Fellow of Trinity Hall, working in the Laboratory of Experimental Psychology at the University of Cambridge. Since 1988, she has been on the faculty at UCL.In her research on social learning in rodents and social cognition in primates, Dr. Heyes seeks to combine the strengths of associative learning theory and evolutionary approaches to the study of cognition. In her own empirical work (e.g. Quarterly Journal of Experimental Psychology, 45B, 81-92, 1992; Animal Learning and Behavior, 21, 221-225, 1993), and through her literature reviews (e.g. Animal Behaviour, 46, 177-188, 1993; 46, 999-1010, 1993; 47, 909-919, 1994; Biological Reviews, 69, 207-231) she promotes the use of learning theory's rigorous methodology to address the important questions posed by evolutionary psychology. She has co-edited with Bennett Galef Social Learning in Animals: The Roots of Culture for Academic Press (1996), and is currently preparing a book on imitation.Dr. Heyes is an Associate Editor of The Quarterly Journal of Experimental Psychology, a Consulting Editor of Animal Behaviour, a Fellow of the 21st Century Trust, and a member of the International Society for History, Philosophy and Social Studies of Biology. She has appeared in several television documentaries on animal thought.